LOW-CARB SNACK TIME DOESN’T GET ANY EASIER THAN THESE CRUSTED DILL PICKLE CHIPS. This is the recipe for deep-fried pickles that you don’t want to turn away from especially if you’re a dill pickle fan and not interested in the extra carbs from thick batter. The first time Mrs. CBB and I had deep-fried pickles was when she was about 6 months pregnant and we stopped off for dinner at a Fish n’ Chips dive in town. The restaurant was empty as it was the end of the night so we were guaranteed hot n’ fresh which is what I like. While looking over the menu Mrs.CBB noticed they offered deep-fried pickles. She was like a little kid all excited so we ordered a plate as an appetizer. I wasn’t a huge dill pickle fan but my wife goes mad for them. I was a changed man when I tasted the deep-fried pickles dipped in mayonnaise sauce. Not only were the deep-fried pickles good but I ate some of the best fish n’ chips since arriving in Canada almost 9 years ago. Growing up in the UK fish n’ chips is a big deal so now we have a go-to spot for fish and deep-fried pickles. A side of these deep-fried pickles would be an alternative to having cole-slaw with your fish n’ chips too. Wait a minute? Why do we have to pay $8 for a dish of deep-fried pickles. I mean it’s literally one jumbo dill pickle sliced into pickle chips, battered and deep-fried in oil. I can make them at home for far cheaper than that although it was a special night out for us so we weren’t too worried about the cost. It wasn’t until Mrs. CBB’s friend from college came around for a visit after not seeing each other for about 8 years. When she opened the door her friend had a huge jar of homemade dill pickles in her arms and offered them to Mrs. CBB. You can imagine how thrilled she was first because she’s never had homemade dill pickles and second she is allowed to eat dill pickles on a low-carb diet. After a lovely visit we put the pickles in the refrigerator as we weren’t in the mood to try them yet. 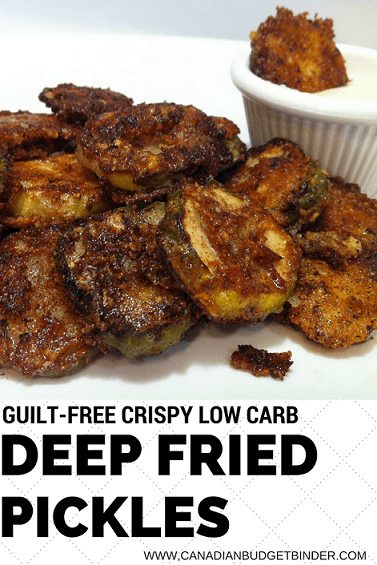 Two days later Mrs. CBB asked me if there was a way to create low-carb crispy deep-fried pickles in butter. I agree that the butter gives the deep-fried pickles a sweet flavour that balances the sour dill pickle taste. Related: Jessica over at Good Cheap Eats has a fabulous recipe for How to make Homemade Dill Pickles. These dill pickles were sour…..eeee! Some of the strongest tasting dill pickles I’ve ever had but damn they were good. 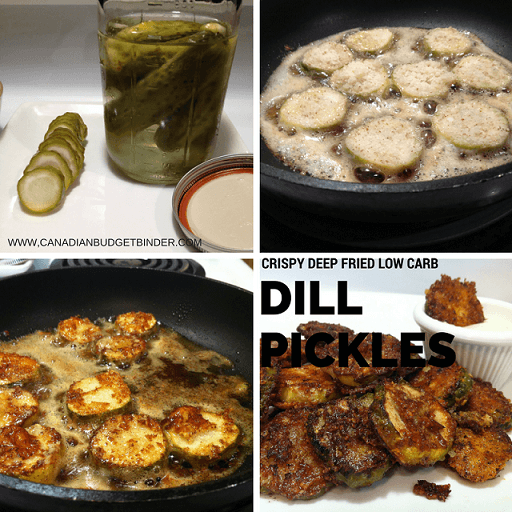 I was transformed into a dill pickle fan so I started thinking about how I could make Mrs. CBB some low-carb snacks. I considered making a batter with almond flour or coconut flour which is possible to do but I wanted to keep the recipe simple. I didn’t want to make a huge mess and stick around the kitchen for an hour just to fry up a pickle or two. You don’t store this stuff so you make what you eat because they are best hot and crispy from the frying pan. Then a light-bulb went off… why not crust the dill pickles with Parmigiano-Reggiano and deep fry them in butter. All you really need is 3 ingredients pickles, grated cheese and butter to make these amazing low-carb dill pickles. What I like is that they are very crispy and light without any heavy batter. If you want a gluten-free snack, this is the one you can make and snack on. I used a deep-frying pan as we don’t have a deep-fryer and loaded it with some butter. Once the pan was nice and hot I added the dill pickle slices which I crusted in freshly grated Parmigiano-Reggiano. The pickle was juicy once I sliced them so the juice helped the cheese to adhere to the pickle slice. In some cases I patted it on and then sat them in the frying pan. It works perfect. Whatever you do don’t move them around once you have them in the frying pan. Using a flat spatula have a look to see if they are golden brown then flip them over once. They should take no longer than 1-2 minutes a side depending on how thick you crust and cut them. I sliced them about an 3/8″-1/4″ thick and loaded them with cheese as you can see from the photo. If you find the cheese is not sticking good enough just add a touch of water and press the cheese into the pickle slice. You could also brush the pickle slices with lemon juice before you add the cheese. The dipping sauce for the deep-fried dill pickles is a simple bacon ranch dressing but you can choose to make any dressing you like or use the store-bought kind. If I have time I’ll make my dip but if not there’s always a bottle of some dressing in the refrigerator. The recipe below is for one large dill pickle. Like I mentioned you don’t want to go overboard unless you know they will get eaten up right away. You don’t want to make them in advance either because like any deep-fried food they will go soggy especially with the moisture from the pickle juice. 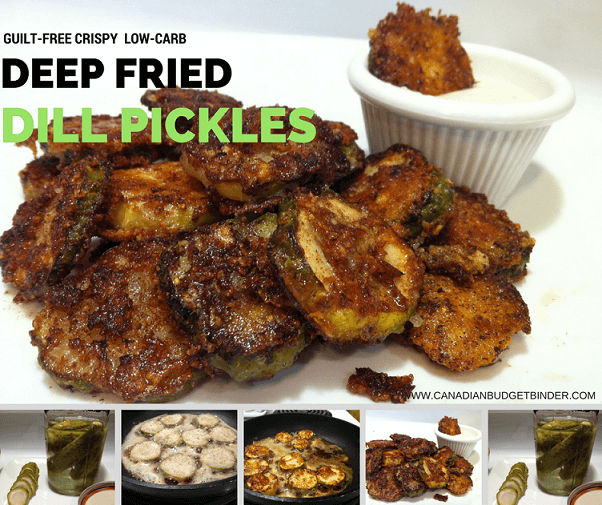 Dill pickles are great to munch on but if you have a craving for potato chips but don't want all the carbs that go along with them then check out this crispy deep-fried Pickles recipe. In a bowl grate your fresh Parmigiano-Reggiano cheese then press each pickle slice into the cheese front and back making sure to coat the pickle heavily and tight. In a deep frying pan crank the heat up to about 8 on your stove dial. Once hot add in your dill pickles and fry for about 1-2 minutes per side or until golden brown. Flip only once. Less is better. Add a side of your favourite dipping sauce and enjoy. These crispy deep-fried pickles will be a hit the next time you have company over for movie night, Super Bowl Sunday or just for a beer and chat. I can see my niece loving these as she loves dill pickles!!! The grandson too!! Might not tell my niece they are fried in butter right now as she is trying to lose a little weight for her wedding next month…… Serious yum!! !